The Colors of Bhutan song and slideshow - 4 min. Single Supplement—$400. If you're traveling alone and wish to share accommodations we will only charge you half of the single supplement. Air tickets, meals not noted in the itinerary, insurance, medical and evacuation, tipping to guides and local staff, visa fees, excess baggage charges, airport taxes, cost of medical immunizations, items of a personal nature, alcoholic beverages, cold drinks, laundry, etc. Entering Bhutan is by air on Druk Air, Bhutan's national carrier and the only airline operating in Bhutan. Druk Air's fleet consists of two British Aerospace jets, which are specially designed for Bhutan. Druk Air flies into Paro Bhutan from Bangkok in Thailand, New Delhi and Calcutta in India, Kathmandu in Nepal, and Dhaka in Bangladesh. On clear days the flight into Paro offers spectacular views of the Himalayan Mountain Range, including Mt. Everest (Chomo Lungma), Mt. Kanchenjunga (Kangchen dzonga), Chomo Lhari, and Kula Kangri. 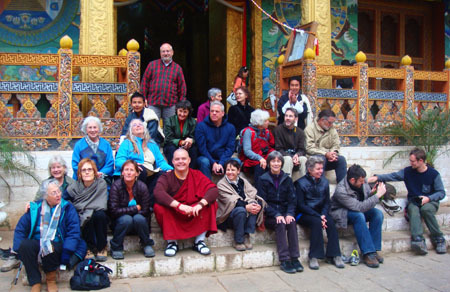 From the moment you enter Bhutan, you are an honoured guest and you will enjoy the traditional hospitality and friendship of the Bhutanese. We can book your tickets with Druk Air well in advance, avoiding the last-minute rush during the peak tourist seasons of Spring and Autumn. Druk Air tickets will be issued and sent to you. For the procedure, it is essential that you send us all information detailed below immediately so that the visa application can be made. The tickets cannot be issued until the visa is approved and this process takes at least 10 days. Please check information carefully; if there are discrepancies in any important numbers when you arrive in Bhutan, there are delays and complications in issuing the visa. The actual visa endorsement is stamped in your passport when you arrive at Paro. When the visa is issued, you need to pay US$20 and present a passport photo with your passport number written on the back. 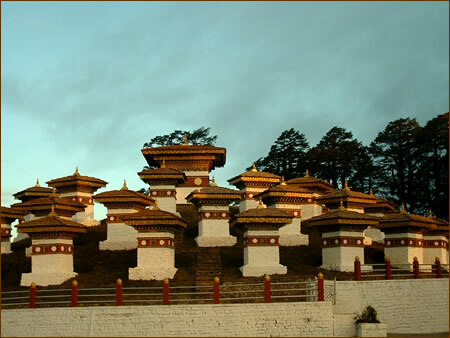 You will then receive a visa for the period you have arranged to be in Bhutan. We will process visa extensions for you if they become necessary. In the bigger towns such as Thimphu, and Paro, comfortable hotels , while in smaller towns, modest but still comfortable hotels. we will ensure that the best available accommodations are arranged for you in advance. Traditional Bhutanese food is ' emadasi', hot and spicy. For our visitors, however, Chinese, Indian, and Continental foods are also served in the hotels and in restaurants. The daily rate may sound high at first, but remember that this includes your accommodations, all food, guide, and transportation within Bhutan.